there's no water better than ECOWATER. 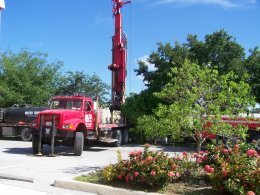 Golden Gate Well Drilling was established in 1977 and has over 30 years experience drilling in Lee & Collier counties. Whether you are in charge of a public or private water system, the undertaking is a big responsibility. To ensure that your equipment continues to run without problems, schedule regular water system maintenance in Naples, FL. Because we keep our own equipment well-maintained, you can trust that we will get the job done right. These services and others will keep your well water systems in tip-top shape. Trust that our employees are experienced with this type of maintenance and will properly perform the work your well needs. Whether you are interested in our well-digging or maintenance services, we make scheduling an appointment easy. Simply reach out to our office in Naples, FL, by calling (239) 455-3131. We will get you on our schedule so that your well can be installed, repaired, or maintained as soon as possible. Additionally, if you are unsure if maintenance is needed, we encourage you to call. We can answer your questions and provide you with a free in-home water analysis.